Sodium is found naturally in foods, but a lot of it is added during processing and preparation. 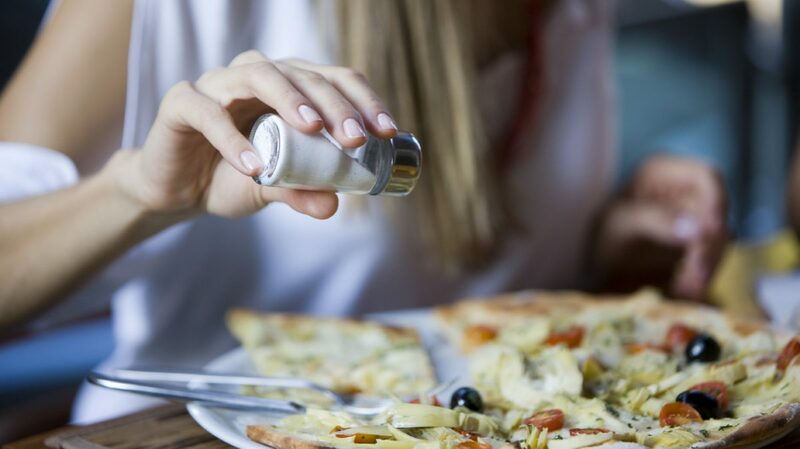 Many foods that do not taste salty may still be high in sodium. Large amounts of sodium can be hidden in canned, processed and convenience foods. Choose fresh instead of processed foods when you can. Use the Nutrition Facts label to check the amount of sodium. Look for foods with 5% Daily Value (DV) or less. A sodium content of 20% DV or more is high. Take the list below with you the next time you go food shopping. Get plenty of vegetables and fruits. Compare labels to find products with less sodium. When you cook rice or pasta, don’t add salt. Tip: If your food comes with a seasoning packet, use only part of the packet. This will lower the amount of sodium in the food. Choose fresh meats when possible. Some fresh meat has added sodium, so always check the label. Choose fat-free or low-fat milk and yogurt. Be sure to check the label on cheese, which can be high in sodium. Milk and yogurt are also good sources of potassium, which can help lower blood pressure. When you cook, use ingredients that are low in sodium or have no sodium at all. Try these seasonings instead of salt to flavor your food.